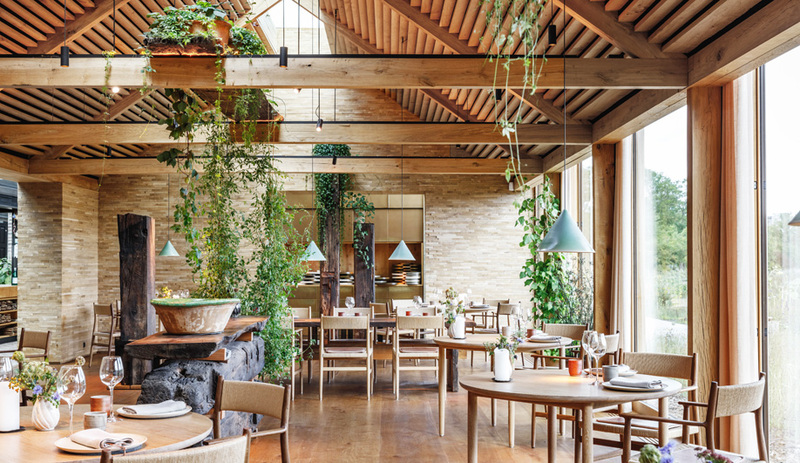 Most of the world’s art museums house cafes these days, but very few of these eateries live up in either splendour or artistry to the institutions that contain them. Café Sabarsky, located on the ground floor of the Neue Galerie in Manhattan, is one. 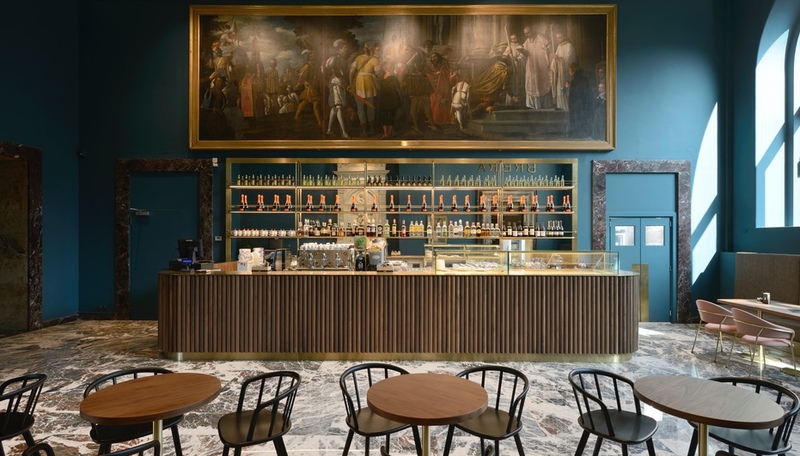 Bar Luce, designed by the movie director Wes Anderson on the campus of the Prada Foundation in Milan, is another. 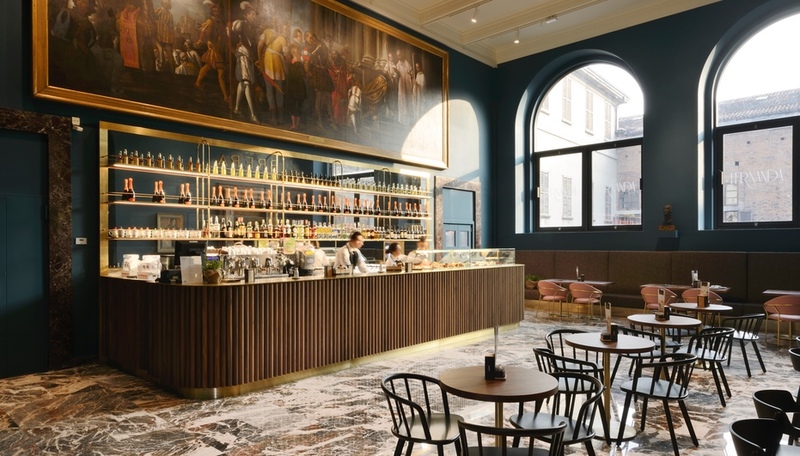 Caffé Fernanda, recently unveiled in Milan’s Pinacoteca di Brera, can also be added to the list. Named after Fernanda Wittgens, the visionary director who reopened the Pinacoteca less than a decade after it was heavily damaged by World War II bombing, the 140-square-metre cafe is part of a larger effort to reimagine the museum’s 38 rooms as well as the art they hold, a task undertaken more than three years ago by current director James Bradburne. Located in the museum’s former main entrance, the cafe is now “part and parcel” of the gallery experience, as the local practice behind Caffé Fernanda’s interior design, rgastudio, puts it. The space’s intense “petrol-blue” walls, for instance, gel with the warm hues of the gallery rooms beyond it. 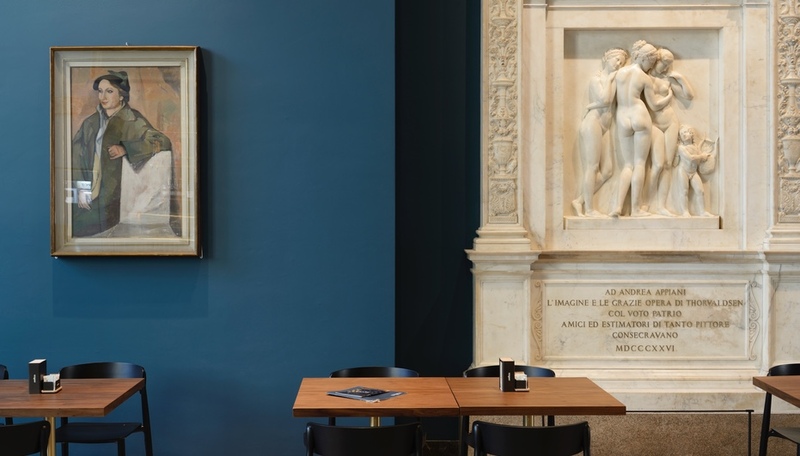 The shade also sets off the strategically placed artworks exhibited in the cafe, which include a 17th-century painting by Pietro Damini, a bust of Fernanda Wittgens by Marino Marini and a portrait of Wittgens by Attilio Rossi. Befitting both the environment and the artworks, adjustable LED projectors, mounted on rails that mimic the pattern of pre-existing plaster beams, are the sole source of light. Recovered and restored, two prominent elements of the previous fifties-era design by Piero Portaluppi – the resplendent peach-blossom marble floors and a series of Lepanto-red wall frames – remain untouched. Below the Damini painting – St. Bernard Converting the Duke of Aquitania – stands a large, round-edged bar backed by a massive mirror. 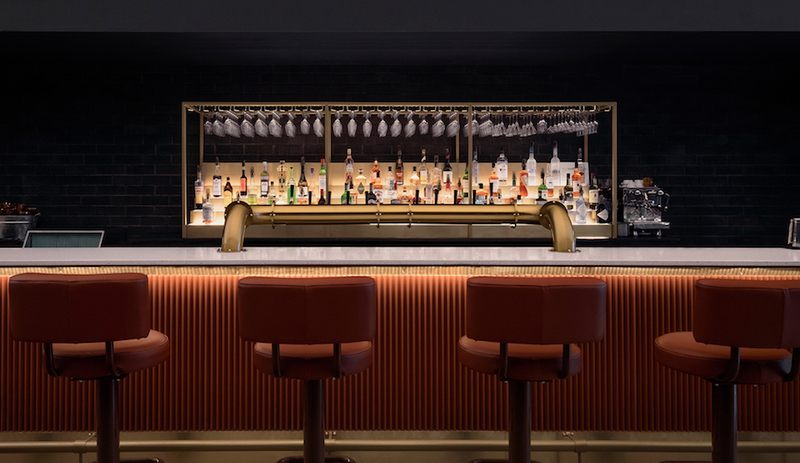 The bar’s design recalls ribbed wooden furniture from the 1950s, albeit with inverted proportions: Enlarged, semi-circular strips of canaletto walnut are topped by an uncharacteristically thin, antique-brass surface. 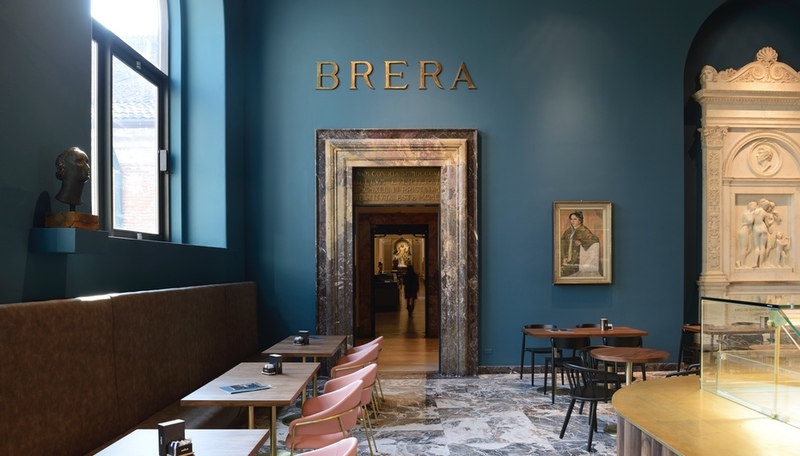 The same brass – thinned even further – frames the mirror, which reflects not only the bar’s bottles, but also fragments of Danish sculptor Bertel Thorvaldsen’s The Three Graces, another historic work on display in the space. 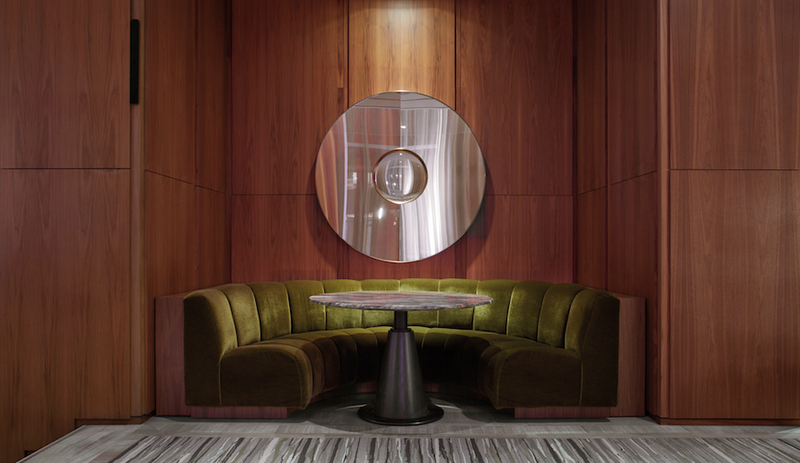 Arranged across the marble floors and alongside a banquette on one side of the room are both round- and square-topped tables made of brass and walnut. The tables lining the banquette are paired with sinuous brass armchairs upholstered in antique pink. 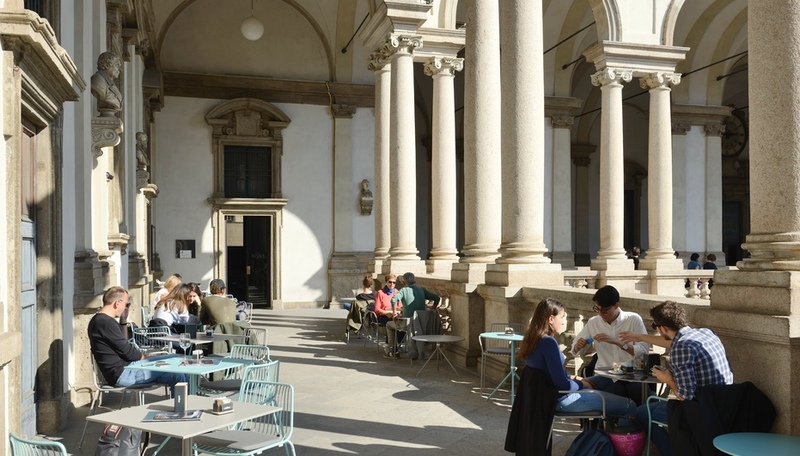 Sitting in the armchairs, visitors can admire the Marini bust, while the tables by the bar offer a privileged view of both the Rossi portrait and Francesco Hayez’s famous Kiss, located beyond the cafe’s threshold in the final gallery of the museum. Although the cafe’s design has been billed by rgastudio as a “reinterpretation of the space’s 1950s architecture,” the judicious integration of historic elements with just the right contemporary touches has made what could have been a merely functional commercial space into an integral part of the repackaged Pinacoteca and a destination in its own right. 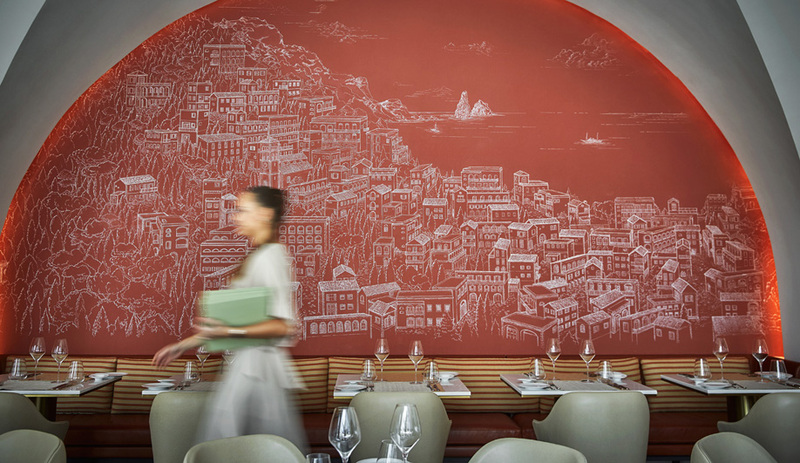 It also constitutes another feather in the cap of rgastudio, which was founded by Raffaele Azzarelli and Giuliano Iamele in 2006 and is developing a reputation for elegant and innovative restaurant and bar designs. Recent rgastudio projects in this category include the Hangar Bicocca Museum’s cafeteria in Milan and the new restaurant/cafeteria on the Lavazza campus in Turin. The architect in charge of Caffé Fernanda was Federica Savoldelli.